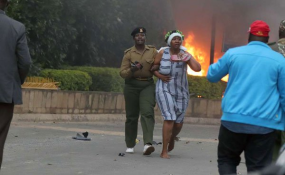 Police rescue people from the Dusit hotel complex on January 15, 2019. The United States has dismissed claims it had prior knowledge of the 14 Riverside Drive attack, which left 21 people dead, 16 of them Kenyans. Speaking on Thursday, US Ambassador Robert Godec responded to reports circulating on social media that a US delegation that had been booked at the hotel had changed the venue just a day before the attack. This fueled speculation that Washington may have been privy to the threat before it happened. "Contrary to some false reports on social media, the United States had no advance notice of the attack, nor did we ever advise American citizens or our staff to avoid the Dusit D2 prior to the incident," Mr Godec said in his message to Kenyans, a day after the siege was declared over. In his message, the US ambassador said it was working closely with the Kenyan authorities to provide assistance in the aftermath of the attack. "We deplore the spread of false information in the wake of this tragedy, which only serves to hamper ongoing efforts to defeat terrorism," Mr Godec said. "We reiterate our deepest condolences to the families and friends of all those who were killed in this craven attack and wish a quick recovery to those who were injured. We stand shoulder to shoulder with Kenya," he added.